McGlynn Pharmacy is happy to help you navigate insurance billing for your medications and prescribed medical equipment. Vickie, our full time billing manager, can help you with any insurance issues. She will help you get your prior authorization paperwork done or call your insurance company if you have a rejected insurance claim. Billing questions? You can contact Vickie at 608-873-3244 or email her at vickie@mcglynnrx.com. Are you or a loved one residing in an assisted living facility or nursing home? McGlynn Pharmacy's Long Term Care Division, RockMED LTC Pharmacy can provide services for you. McGlynn Pharmacy wants to help keep our patients healthier. MedSync customers will have their medications “synced” so that all of their medications can be filled on the same day. McGlynn Pharmacy staff will study the medication profile and choose the day that best fits with the patient’s current drug regimen. Once an “appointment day” is selected, we will fill all prescriptions on that day. All the patient has to do is come and pick them up. MedSync is designed to increase a patient’s adherence to their meds, helping control chronic conditions. It is also designed to minimize trips to the pharmacy, saving time, gas and money! MedSync is a FREE service. MedSync Ultra also works to help with adherence to medications. Patients enrolled in MedSync Ultra get their medications packaged either in medications boxes or in bubble packing. 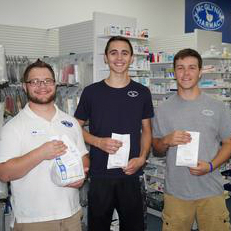 McGlynn Pharmacy staff will fill their prescriptions, package them and deliver them to the patient’s home. This is the ultimate way to help our patients make sure they are taking their medications properly. MedSync Ultra is available for a small monthly fee. Medication Therapy Management or MTM is a formal way of describing what McGlynn Pharmacy has done for years. MTM includes monitoring your drug profile for gaps, interactions or other opportunities. It can be as simple as a pharmacist interaction as you pick up your prescription or can be as specific as making an appointment to sit down with a pharmacist and discuss your medications in detail. Our pharmacists will help personalize your care by identifying the best medications for your conditions as well as making sure you are taking the most cost effective medications available. We will work hard to give you the best care at the best price. 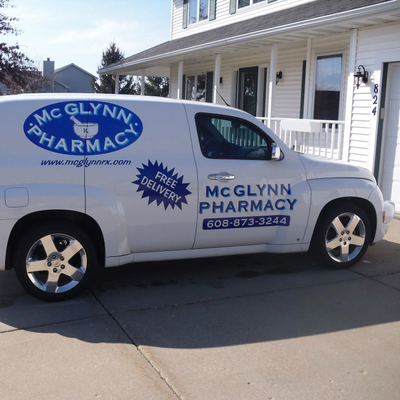 McGlynn Pharmacy offers free delivery for your convenience. We will bring your prescriptions and other items right to your door. Whether you're home bound, have a busy lifestyle, or just don't feel like going out. Our drivers will come right to your door and deliver the items you need. 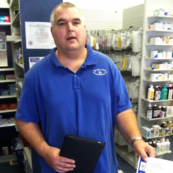 Dave L. is our main delivery driver with support from Leo, Tommy, and Max here at McGlynn Pharmacy. Delivery service is available Monday through Saturday and can be arranged for same-day service. And best of all, it's FREE! All of our pharmacists are certified to give immunizations. The most common immunizations we give are the flu shot and Zostavax (shingles shot). But we can and do give many other immunizations at the pharmacy. These include vaccines for Pneumonia, HPV and Meningitis. Getting an immunization at the pharmacy does not require an appointment and most vaccines are covered by insurance. Getting your immunizations at McGlynn Pharmacy is convenient and typically costs the same or even less than going to the doctor’s office. Please contact the pharmacy for specific information regarding vaccine availability and insurance coverage. Prevnar 13 and Pneumovax 23 are vaccines given to prevent infection from the Streptococcus Pneumoniae bacteria. These immunizations are given to most adults over the age of 65 in two separate vaccinations. Usually, the Prevnar is given first with the Pneumovax given 6 to 12 months later. These immunizations can be given at McGlynn Pharmacy and are usually covered by insurance and/or Medicare. Click here for more information about Prevnar 13 & Pneumovax 23. Flu shots are most commonly given during the fall and winter months. We have vaccine available in early September and normally have enough stock to last well into January or even February. If you want to get a flu shot at McGlynn Pharmacy, the process is easy. There is no prescription necessary and best of all, there is no appointment necessary. Flu shots are covered by Medicare and many other private insurances. Private insurance coverage varies, so please call and we can find out what your specific carrier covers. Click here for more information on flu vaccinations. Zostavax, otherwise known as the shingles shot, is a once in a lifetime vaccination given most often to people over 50. This vaccine is intended to prevent the development of shingles, a viral disease similar to chicken pox. This vaccination requires a prescription from your doctor and is covered by Medicare Part D and many other private insurance plans. Coverage may vary, so please call and we can help you determine what cost, if any, there would be for you. Click here for more information about shingles and Zostavax. Give our team a call at 608-873-3244 for more information.